Friday Five, 5 blogs to check out! It’s Black Friday! I hope you are enjoying yourself, whether that enjoyment is coming from waiting in the cold at a big box store or sleeping in and enjoy a day off or just spending time with family it’s all great (well, I’m not really down with waiting in the cold, but that’s just me!). I did wake up early and go to Fleet Feet in Annapolis because I desperately needed a new pair of running shoes. But now my plans involve wedding venue visits, lounging in front of the TV and naps. What a glorious day it’ll be! 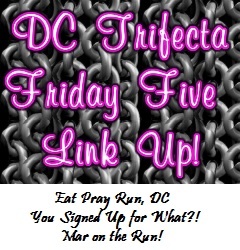 Anyway, this Friday, Mar from Mar on the Run, Cynthia from You Signed Up for What?! and I are still linking up and this week we’re each highlighting 5 great blogs you should add to your [bloglovin, feedly, etc.]. Karen Loves to Run. Karen is a teacher living in the Philly area and is training for her first marathon. She’s also planning her wedding, so we have lots in common. I love her upbeat posts and I’ve really enjoyed reading as she gets closer and closer to her first marathon (in January!!). Olive to Run. Written by Cori, this blog is full of inspiring posts and I love her tagline “not all runners live in a size zero frame.” She is also super funny and a great person to follow on instagram! From Fran to Flash. Fran is awesome and was just chosen to be the Cherry Blossom 2014 social runner, which just makes her more awesome. Her blog is fun, light hearted and a definite must read. Heart & Sole. Colleen, my Oiselle teammate and fellow local gal pens Heart & Sole. Colleen is not only a great writer, she is a super speedy runner and sweet to boot! She has great insight into the sport and I love reading her posts. There you have it — some of my fav blogs — please show them some love! What are some of your favorite blogs I may not have read yet?? More blogs mean my poor blog feed is going to blow up! Happy Friday and thanks again for hosting the link Up. Love it – thanks Anita!! I’ll have to check some of these out – some I have read before. Great! Thanks Courtney!!! I’m honored! I’ll definitely check out these blogs! What a great list! I loved reading Karen’s blog! She’s pretty awesome 🙂 BTW, I also love your blog!! I hadn’t read that one — thanks for sharing! I read Olive to Run pretty frequently, and will have to check out the others! Elizabeth recently posted…Five for Friday!